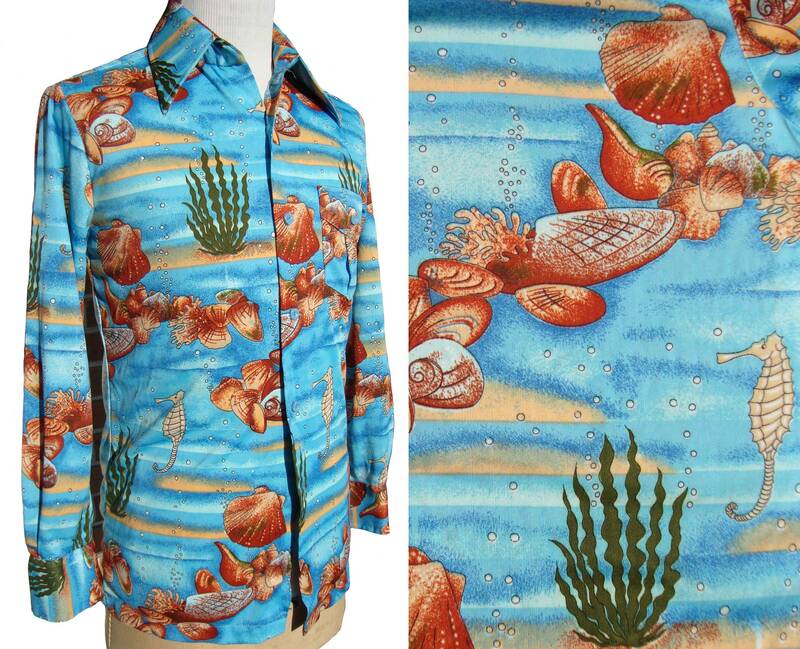 A charming look at life under the sea is explored in this fun vintage men’s disco shirt, with vivid seascape novelty print by Martini, circa 1970s. The brightly colored shirt is comprised of a polyester jersey fabric, and features an underwater ocean print of shells and mollusks, seaweed, and little sea horses – in shades of various ocean blues, burnt orange, maple, cantaloupe, beige, and forest green. The shirt has long sleeves, pointed collar, button down placket, single patch pocket, and embroidered labels for “By Martini”, “100% Polyester”, with a size tag of “M”, and a label with fabric care instructions along with "Made in Taiwan". *Please note – there is a button missing from the very bottom of the shirt, as well as from the top collar, as shown (see pics 7 & 8). Otherwise, the shirt itself is in very good condition, with all colors remaining vibrant and intact.